Weekends are for two things: sleeping and big breakfasts. Well, maybe only for big breakfasts if you have kids. I don’t, so I sleep in and then eat a big breakfast. The brown egg is free range, antibiotic, hormone free. The white egg is from the grocery store. Notice the first egg. 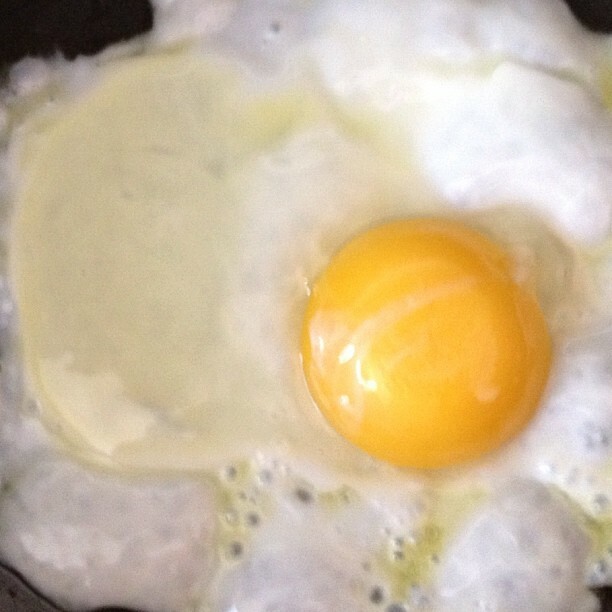 It looks like a nice enough egg and is frying up splendidly. But notice the second egg. Look at that yolk! It is such a lovely shade of gold-ish orange! Which one is free range and pasture fed? The one on the left. Notice the darker yolk. 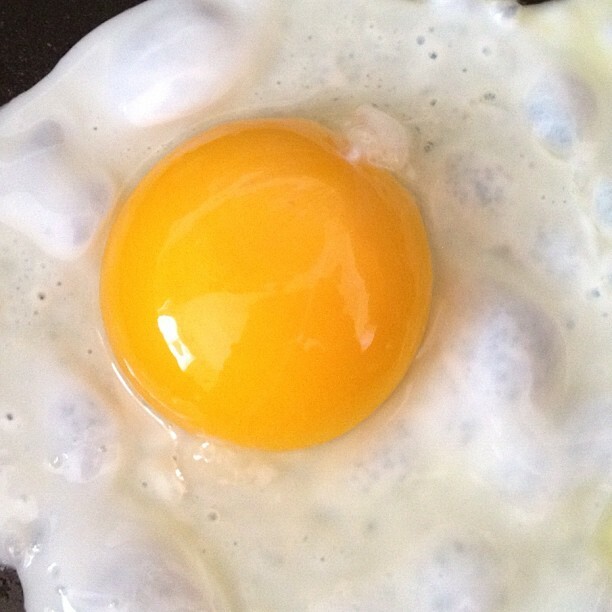 The color of an egg yolk is determined by a chicken’s diet. Yolks from caged birds that do not have access to green vegetation and little to no sunlight, like my grocery store egg, will be a paler color. Free range chickens that eat grass, leaves, bugs and roam around in the daylight will lay eggs with much darker yellow to almost orange yolks. Happier chickens mean better eggs. Better eggs mean more nutrition. Based on a 2007 study, eggs from free range hens are much more nutritious than factory farm eggs. More vitamin D (4-6 times more), more omega-3 fatty acids (2 times more), more vitamin E (3 times more), and less cholesterol and saturated fat–all wrapped up in a tastier, fluffier egg. I’m sold! So where can you buy these amazing eggs? I get mine from my farmer’s market. You can get them there too, or from your own farmer’s market, or from your hen-keeping neighbor, or if you buy from the grocery store, choose Certified Organic. Unfortunately, cartons marked “free-range” in the grocery store may not be free-range at all. It just means that the hens have access to the outside, but they rarely make it out there. They also eat the same kind of feed that factory farmed hens eat. So if you want to be absolutely certain that you are eating the most nutritious egg you can find, make sure you know where it comes from or buy Certified Organic. Did I mention that my entire breakfast Saturday morning was local? It was simple, but so delicious. The egg was the best part, of course. Nice post and great photos! 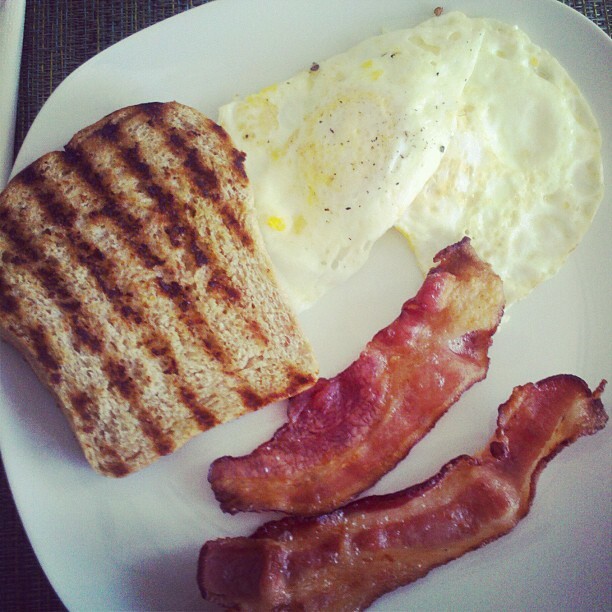 We love our local eggs (and bacon, and sausage…) Yum! I don’t think we would ever go back! Thanks! I don’t know how I ever ate grocery store bacon. My husband and I say that every time we eat breakfast with this bacon. We also get homemade sausages. So good! We have a friend that gives us fresh eggs and they are so much better than store bought. 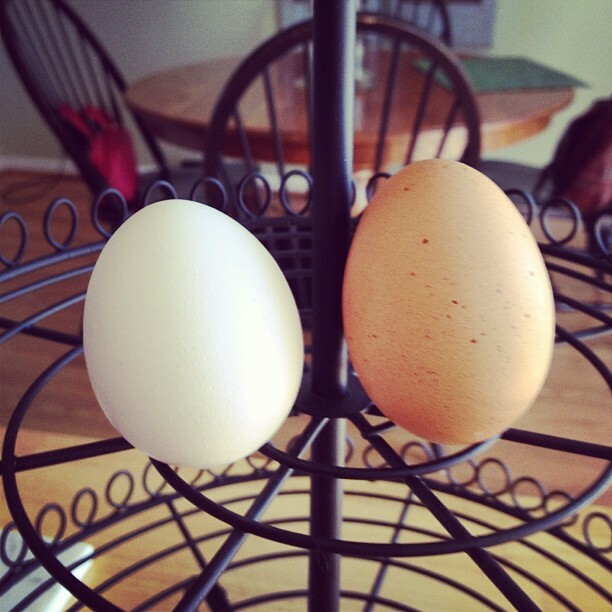 My friend Valerie raises chickens, and I can’t wait to try the eggs. I won’t ever go back to store bought eggs! Just a little FYI about farmers market, or supposed “farmers markets”. I was buying beautiful, large brown eggs from the New Castle Farmer’s Market at the veggie stand on the far west end of the market. Always thought they seemed like really good, natural eggs until I looked at where they actually came from – the egg farm out west that was shut down for numerous violations after consumers became sick. Luckily I never got sick but I learned to be more observant and to never assume the eggs at the “farmers market” have actually seen a farm!! Thanks for the heads up, Kat! The eggs I get are raised in Lancaster County, PA and I’ve talked to the seller in detail. He’s one of the good ones. I’m so sorry to hear of your experience, but I’m glad that you posted your experience here. That’s why it’s so important to know where your eggs come from. I wish we could all buy from our neighbors. I would have chickens in my back yard if my town house community would allow it! I don’t believe it either! They are worlds apart! Great comparison, Rachel. Hi Danielle! I somehow missed Emmy’s comment when I first posted this eggsperiment. 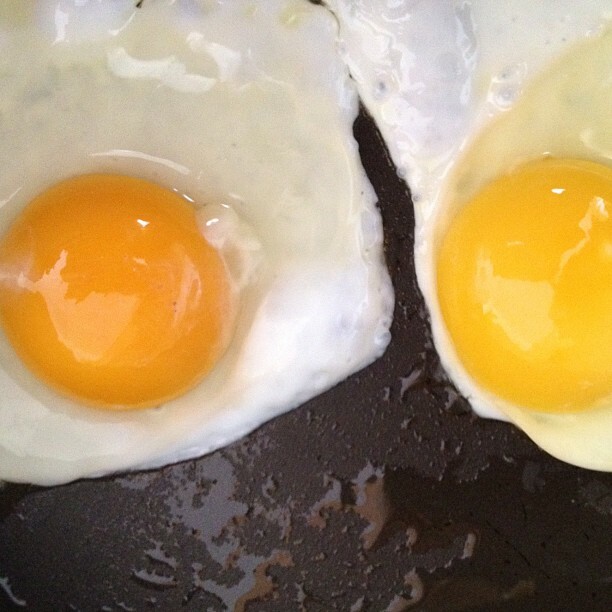 And yes there is no comparison; backyard eggs like Emmy’s or free range, pasture fed eggs DO taste better. My CSA is offering eggs now and I can’t wait to try them! Local farm fresh eggs are the reason I’m not vegan. Just love them. Haha! I’ve turned my mother over to our ways, too, Tammy! She won’t eat grocery store eggs anymore. In light of my post about Don Gingerich’s organic eggs a few weeks ago, this post is fantastic. Thanks to Rachel of rachels-table.com for this enlightened post! Hi Sarah! Thanks for the reblog! This was a fun post to write. I won’t ever go back to store bought eggs! My daughters free range chickens lay white eggs, pink eggs, tan eggs, light brown, dark brown and purple/red eggs. so color is not an indicator of quality. Hi! Only the color of the yolk indicates quality, not the color of the shell. It just so happens that the free range pasture fed eggs I buy are brown. But the farmer I’ll be buying from next week has pretty pink and pale tan ones. Thanks for stopping by! “Certified Organic” doesn’t mean the same as “free range”. You are right when you say that a “free range” chicken might not actually get much actual ranging. But “Certified Organic” only refers to the food the chickens are eating not how they are treated. Lots of organically fed chickens are raised in cages. Your best bet is to go for labels that say both “organic” AND “pasture raised”. And better yet, get your eggs from a neighboring farm if you can and skip the labels altogether. Or keep a couple chickens or ducks in your own backyard if at all possible. You are right, Annie! Skipping labels altogether and actually MEETING the chickens that lay the eggs is the best way to go. My grocery store doesn’t sell pasture fed (the nearest Whole Foods is about 40 minutes away) so Certified Organic is as nutritious as you can get when visiting my area. That’s why I always buy from the farmers market or now from my CSA farmer. Farm fresh eggs have NO comparison. I will never eat a grocery store egg again. Thanks for stopping by!